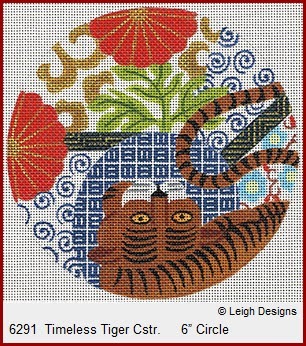 This needle felting tutorial uses the small 6x6 version of the Timeless Tiger from Leigh Designs' Imari design series (above). This piece is on 18 count canvas. Note that Sandy Arthur, who has taught needle felting at a lot of shops by now, recommends the needle felting be done last unless you are doing something nearly (like ribbon stitches) you don't want to risk poking with the felting needles. She's found her students catch the felting on the back in their stitching next to the felted areas if the felting is done first. Sandy's the most experienced needle felted among us, so felting last is probably safest. Don't forget to be careful with those sharp, barbed needles! Donna shows how needle felting can be used in a non-traditional way--combined with Flair! Needlepoint Tool Time now sells the Clover needle felting tools as a complete kit. Everything except the wool roving is included. By the way, if you want to take a needle felting class, look for one by Sandy Arthur, who has taught more needle felting than any other needlepoint teacher to date. She also has been felting from the back side so that the front has a slightly different, fuzzier and less sculptured appearance. Consider doing this for something a little different yourself. I'm so glad you made this a tab on your blog. I finally got some materials and supplies together, then pondered the prospect of finding all the posts you made about this. Thank you for making my life so much simpler! Happy to help! I'm going to start writing the next article on this shortly. Got delayed by Destination Dallas deadlines. Stay tuned!